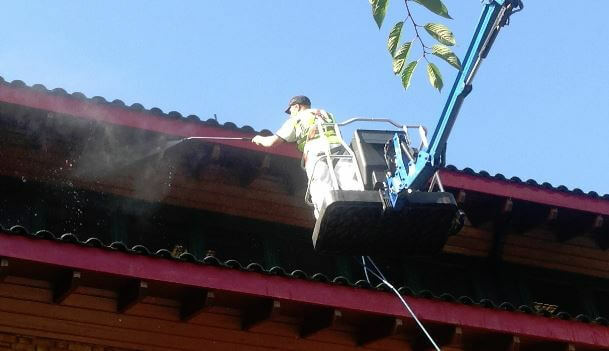 MC Property Maintenance are experts in all forms of building exterior upkeep ranging from high level access painting and decorating to gutter cleaning and bird prevention. With experience in all types of property maintenance, London is one of the main locations we serve. We have built up a reputation for producing a very high quality of work at excellent value for money. As one of the South East’s leading painting and decorating contractors, you can rely on us for a huge variety of services. Whether you need interior or exterior painting, gutter cleaning or even repairs to damage, we are more than happy to help. We are skilled in all types of high access work including light installations, roof surveys and other building maintenance. We have a wide variety of cherry pickers meaning we will certainly have the perfect one for the job. This ensures we can carry out work quickly, effectively and safely – using our services can save you time and money. MC Property Maintenance has worked with businesses on commercial and industrial premises throughout London. We have dealt with everything from smartening up storefronts to carrying out routine maintenance on warehouses. We work on residential properties too. Of course, we all want the exterior of our home to look fantastic – our services are ideal for homeowners, whether you need state-of-the-art DOFF system cleaning or just a fresh coat of paint. We are often contracted to plan, organise and manage large scale painting and decorating projects, so no matter the size of your operation, we will be able to provide an effective solution from start to finish. Using one company for all of your maintenance needs will cut the cost and give you peace of mind that everything will be carried out to a very high standard. Our staff are all skilled tradesmen with the relevant qualifications and health and safety regulations. If you require any form of property maintenance in London don’t hesitate to get in contact with us today. You can call on 01243 262714 or send us a message. We are happy to provide 24-hour property maintenance – on call at any time to deal with urgent issues.